In my last article I discussed about the top command. In this article I am showing how to use percent with top command. I am taking the table same as I used in my last article. But we can also select Data in percentage (%) using top command. Using percentage it will show the row Accordingly. For example if table contains 4 rows and I select 50% then it will Show 2 rows. 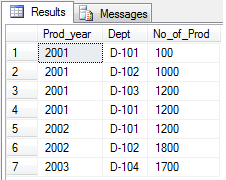 The top command is used to select the top value from the table. We have to give the number of row with the top command. 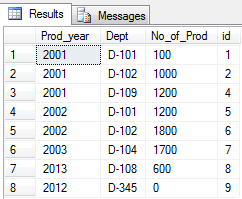 Consider the following table as example in which it shows the prod_year, dept and no_of_prod. When we need to store data in SQL Server in XML format .in this situation we can use XML Data Type. Between operator is used to select the data between any range. in this example it will select data between 1000 and 1200. Note:-between operator include the range also. It means it will also select those data which contain 1000 and 1200.